How does PGS improve IVF results? A genetic test, known as pre-implantation genetic screening (PGS), is widely being used to improve the success rates of IVF. Most IVF failures are often linked to poor quality of the embryo and fertility clinics recommend PGS to such patients. So how does PGS improve IVF results? PGS screens embryos for abnormal chromosome number (aneuploidy). This is a major cause of both implantation failure and miscarriage. Therefore, it allows doctors to transfer only the healthy embryos into the uterus, thus improving the chances of IVF success. There is always a chance for the occurrence of chromosomally abnormal embryos. In fact according to this study published in Biomed Central, nearly 50% of all IVF embryos are actually aneuploid. However, there are certain scenarios where the chances of abnormalities in chromosome number may be more common. For this reason, there are certain patient groups who may especially stand to benefit from PGS. Who will benefit from PGS? Couples in which one or both partners are carriers of a genetic disorder—they will be recommended PGD. Women who have experienced recurrent miscarriages, including ‘chemical’ pregnancies. Recurrent miscarriages and failed IVF attempts can be the result of aneuploid embryos. 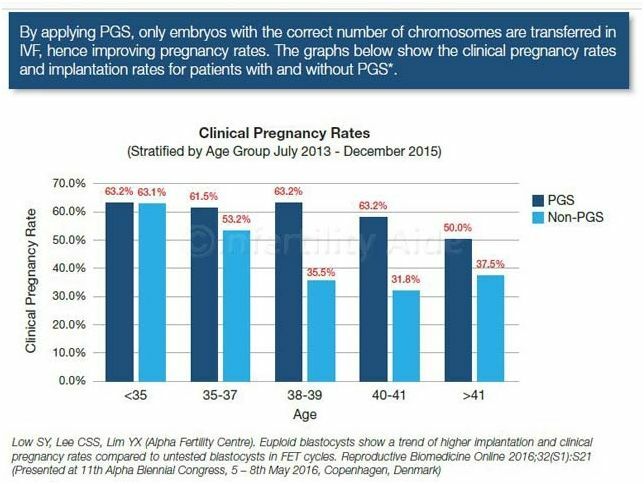 The incidence of chromosomal abnormalities and consequent fertility problems increase with advancing maternal age, and various studies have shown that the use of PGS can increase the chances of a successful pregnancy, in cases such as these. Increases in IVF clinical pregnancy rates were seen following PGS in women who were over the age of 35. The largest increase in rates occurred in women aged between 38 and 41. PGS had very little impact on the rate of pregnancy in women below 35. Taking into account the effects of increasing age on fertility, these results are not surprising. 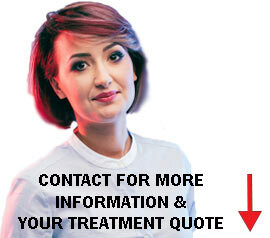 They suggest that women over the age of 35 are more likely to benefit from PGS and that there may be very little benefit in the use of PGS to improve IVF success rates in women under 35. If a chromosomally normal embryo is transferred into an older woman, the chances of successful implantation and pregnancy are not significantly different to that of a younger woman. Additional studies and data from fertility clinics also support these findings. As an example, the Biomed Central study mentioned above states that: comparing the ongoing pregnancy rates between embryos selected through PGS or just on morphology alone, showed these to be 69.1% vs. 41.7% respectively. Embryos which look healthy on examination under the microscope can still potentially have problems that may affect successful implantation and pregnancy. What are the other benefits of PGS? Single miscarriages are relatively common, with 1 in 4 pregnancies ending this way. Multiple miscarriages however are less common and can be caused by chromosomal abnormalities. Therefore, choosing only the healthiest embryos for transfer may help to prevent this.Despite there being limited data available, a systematic review published in Fertility and Sterility in 2011, describes a marked decrease in miscarriage rate from 28% in the natural conception group, to 9% in the PGS group. PGS enables a single, healthy embryo to be transferred to the uterus. PGS may shorten the length of time needed to achieve a successful pregnancy. This can be a particularly important factor, given how emotionally and financially draining the process of IVF treatment can be. Limited sample sizeOnly a few cells are removed for PGS analysis. These may not accurately represent all cells within the embryo. Mosaicism Mosaic embryos have both normal and abnormal cells present. If the number of abnormal cells is small, these embryos may not be identified as problematic. Their use may or may not result in a healthy pregnancy. PGS is usually recommended by fertility doctors to the patient groups described above. PGS is able to identify abnormalities in chromosome number. These abnormalities can often lead to failed attempts to establish and maintain a successful pregnancy. Therefore, through choosing embryos lacking these abnormalities, the success rates of IVF treatment may be improved. Studies and clinical data show an increase in pregnancy rates when PGS is combined with IVF. As shown in the data presented above, from Reproductive Biomedicine Online, this increase can be as much as ~ 30%. 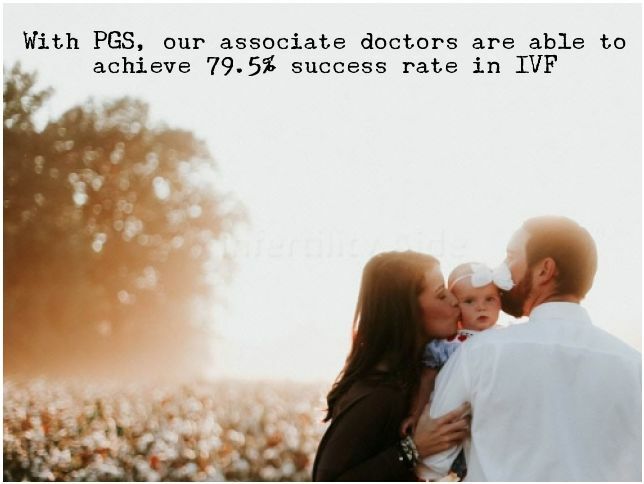 The average success rates of IVF around the world are said to be less than 50% but our associate IVF doctor in Malaysia is able to achieve success rates of 79.5% with IVF + PGS. Similarly for IVF-PGS in Thailand, the success rates are 60-80%. As well as increasing the chances of a pregnancy occurring, PGS alongside IVF also decreases the chances of miscarriage and raises significantly your possibility of delivering a healthy baby. Most IVF failures are often linked to poor quality of the embryo and fertility clinics recommend PGS to such patients. So how does PGS improve IVF results? PGS screens embryos for abnormal chromosome number (aneuploidy), which is a major cause of both implantation failure and miscarriage. By allowing the doctor to select healthy embryos, PGS also reduces the chances of miscarriage.